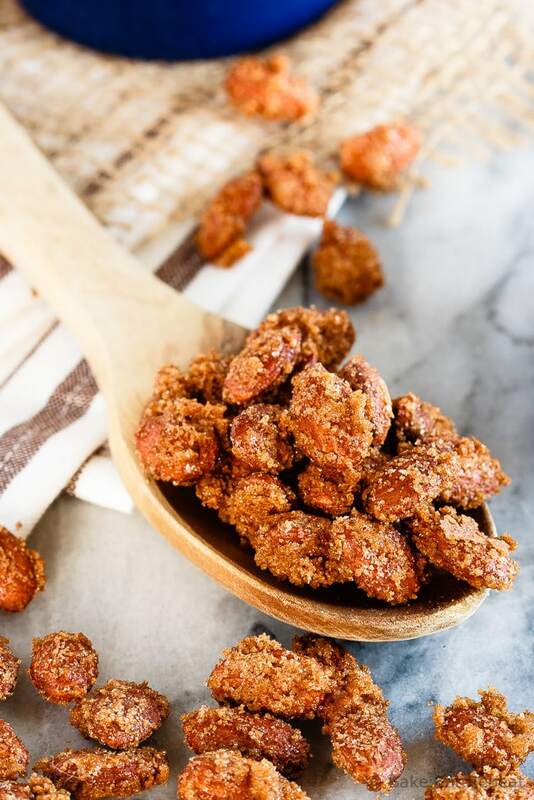 Easy cinnamon sugar almonds. 5 minutes of prep time plus one hour of baking equals completely addictive, crunchy, candied almonds. The best kind of snack! I think candied nuts might possibly be the most addictive snack ever invented. 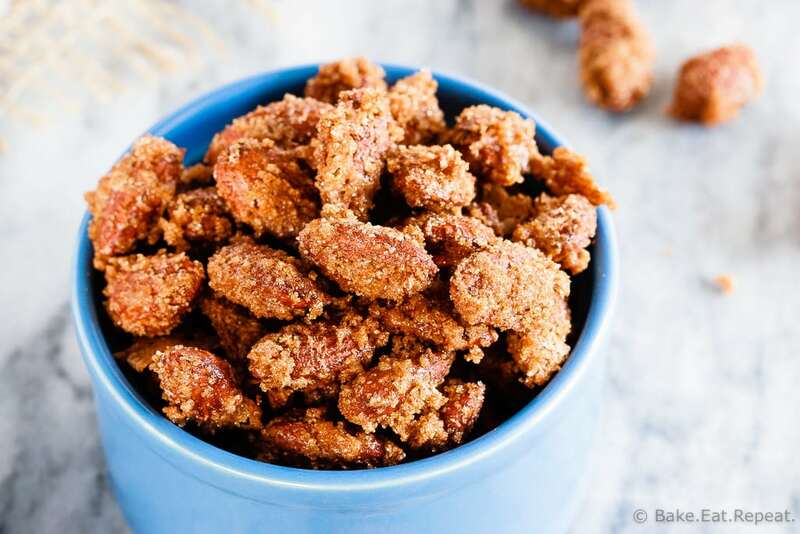 These cinnamon sugar almonds are incredible, and definitely addictive. Whenever I make these, they are virtually impossible to stop eating. We have to hide them from ourselves to ensure they aren’t all gone immediately, if not sooner. Or give them away since we clearly can’t be trusted in the same house as these little treats. Candied nuts aren’t something that I remember having much growing up. The first time I remember having them was when I spent 6 months in Germany at Bible College. I was there over the Christmas season, and was wowed by the Christmas markets. They were so neat, and if I’m ever in Germany again, I kind of hope it’s near Christmas just so I can go to those markets again! We don’t have anything like that here. The one kiosk that we all spent far too much money at was the one making candied nuts. They were completely amazing. Warm, freshly made candied nuts served in a paper cone while walking around on cobblestone streets with Christmas music playing. Amazing. That paper cone was always empty far too quickly though! Now that I’ve discovered the complete simplicity and ease of making these cinnamon sugar almonds at home, that’s one memory I can easily relive. These are pretty close. We’re not eating them out of paper cones, hot from the pan, while walking through the crisp night air over cobblestone streets. But you can’t have everything. I could make some paper cones I suppose. And it’s cold outside. We could go for a walk. It’d be exactly the same, right? Well, at least the almonds will be just as amazing! In a large bowl, mix together the brown sugar, granulated sugar, cinnamon and salt until well combined. In another bowl, whisk together the egg white and vanilla until frothy. Add the almonds to the bowl of frothy egg whites and toss until the nuts are completely coated. Then pour the coated nuts into the bowl with the cinnamon sugar mixture and toss until they are well coated. Pour the nuts onto the prepared baking sheet and spread them out evenly. Bake for 1 hour, stirring every 15 minutes. Allow the nuts to cool completely on the baking sheet. Store in an airtight container at room temperature for 2-3 weeks. Source: Adapted from What’s Cookin Chicago . What kind of almonds do you buy to make this with? I tried and failed miserably a different recipe. I have been wanting to try again but be sure that I don’t mess up. Thx! I just buy whole almonds that still have the skin on them, with no salt or anything. Whole roasted almonds I think is what the bag said. I always get the big bag at Costco! Hope you like these! my candied nuts go in a feed bag..haha love these but then I'm hooked on Spiced nuts , 3 alarm almonds , Polynesian nuts , candied pecan snacks , Chocolate nuts , as you can see anything nuts. I usually buy about a dozen small tins at A time and put a variety of nuts in each tin.. they don't have too be just a Christmas treat . These look amazing and super crunchy! I have a ton of almonds at my house so this would be a good way to use them up! They are so crunchy and addicting. We seriously could not stop eating these! Thanks Kelley! I can't wait to make these tomorrow & take them to my sister's to enjoy Christmas Eve! She said not to bring anything, but this would be such a great addition to the 'spread', and we'll be really hungry by the time the Christmas Eve Service is over at 7:30, so we'll NEED the extra protein, right? I really enjoy your blog, Stacey, and this one was particularly fun to read! You might be on your way to becoming a writer - if you DO take off in that direction, I hope you'll continue to keep offering these great recipes! Thanks so much! Have a great Christmas, hope you like the almonds! I actually made more yesterday for some gifts and had a very happy family. Highly addictive little things! Yummy! I'm going to try this recipe, but with pecans. i just can't get enough of them. That was actually a toss up when I pulled out stuff to make them, almonds or pecans! But I went with almonds cause they're my favourite! I'm definitely planning on trying it with pecans next time. Let me know if it's good with them if you try it! Keep these away from me! I'll eat them all in the sneakiest way possible. I can tell they're too good to pass up! Wow - these look sooooo good! The pics are gorgeous too! I couldn't agree more - candied nuts are so addictive. They are a dangerous snack to be hooked on too because they are little calorie bombs. Haha! In small doses, kinda healthy, but I am prone to going overboard! Lol! These look wonderful! Haha, I'm totally prone to going overboard on stuff like this too, I'm keeping them out of sight! Thanks Sarah! I would be so addicted to these, I'd probably eat the whole batch without even thinking twice! Hahaha, that's why I hid them away from my sight, before that did happen! :) Thanks Dorothy! Candied nuts are one of my all-time favorite Christmas treats. No way could I be trusted by a jar of those. They would vanish! It's a bit insane how quickly they are disappearing here! Definitely not something that can be made too often - Christmas treat for sure! Thanks Erin! I feel the same way, I love candied nuts and could eat the entire batch since they are so addictive! Yours look absolutely amazing - that coating is just gorgeous! Yum, I could snack on this all day long! I love candied almonds and these look delicious and perfectly coated! Will definitely try the recipe! Pinned! Definitely one of the most addicting snacks ever! This is a perfect gift...and, hey(!) who says we can't treat ourselves to a little gift every now and then ;) I've never made sugared almonds...sugared anything, really - it's time! I love them! Oh man, I can totally see why you guys went to town on these--they look incredible! I'm a total sucker for sugared almonds and now I'm craving these like mad! Thanks Sarah! We've already decided that I can't make them again anytime soon - far too dangerous! Lovely Christmas treat thought! Thanks for the pin! wow!! these almond look so delicious! cinnamon, sugar and almonds, what a simply idea yet so yummy surprise! Yup, it's a problem! They probably aren't going to last too long! Thanks Michele! I bake so much that I typically don't have trouble avoiding my sweets. But when I make something like this...I just practically need to put a muzzle on myself. I don't know if this is a case for making these or avoiding them!!! Gosh they sound and look SO good. Haha, I had the same debate with myself before making them! Do I really want those in the house?! It's Christmas, it's okay! Thanks! Oh my gosh these look absolutely amazing!!! Quick and easy holiday treat. This would be great as a gift for the holidays. Thanks Kelley! They were so quick and easy, I was actually kind of surprised at how easy they are to make. And so good! Omg, I bet these are so addictive. I think they would be really good with a little bit of chilli in it too. Haha, funny you said that, as I was snacking on them last night I was thinking about all the different things I could add to these things to change them up! Chili powder was definitely on the list! I'll have to try it. Thanks Dannii! 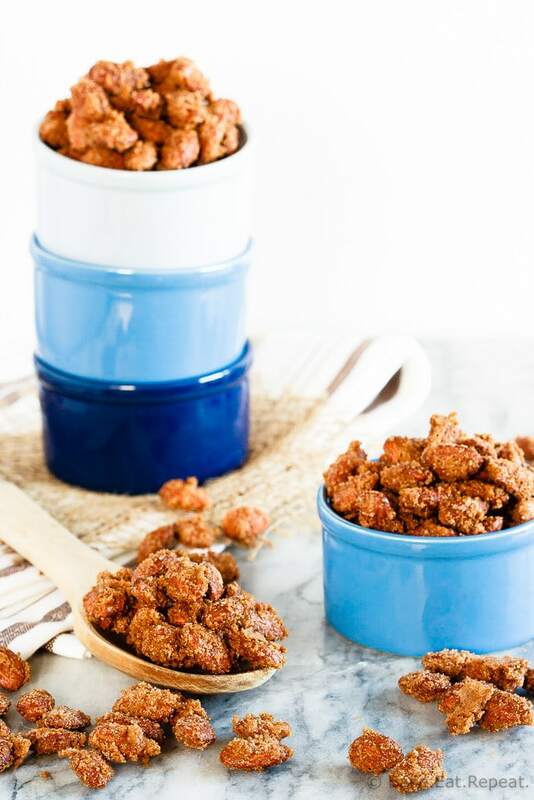 Candied nuts are definitely one of the most addicting snacks! I didn't have these much growing up either, only when we would find a stand when on vacation. But now, my mall has a little kiosk that sells these...go figure! I love making cinnamon sugar nuts too, they always disappear so fast in my house! And these would make perfect gifts, too. Such a great idea, Stacey! I know right?! That's exactly what I said! And then I bought them. And ate them really, really quickly. But these almonds were pretty awesome too! Thanks for the pin Taylor!